One of the things we love most about this season is bringing the warm colors of fall into our Hiland Home. 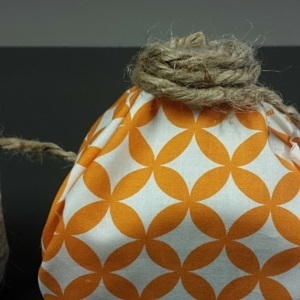 If you haven’t already used all of your empty Hiland Dairy milk jugs to make Milk Jug Ghost Lanterns, we’ve got another great way to upcycle them with these Milk Jug Fabric Pumpkins! Tip: Collect and save a variety of milk jug sizes to create an appealing grouping to display in your home. Tip: We used approximately one yard of fabric to make pumpkins from one gallon jug, one half gallon jug and one quart jug. Tip: Make sure you have plenty of glue sticks on hand for this one! Rinse jugs and allow to dry completely. Tip: Save yourself some time and don’t worry about removing the labels from the jugs (they’re going to be covered with fabric, after all). Remove cap and cap ring from each jug. 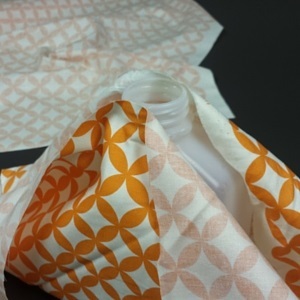 Using scissors, cut scrap of fabric so you have enough to cover each milk jug. 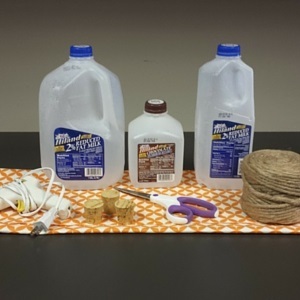 Wrap each milk jug with fabric, securing it with the hot glue gun. Tip: Be careful to not burn yourself with the hot glue. Unless you have a low temp glue gun, this project should be done by adults only. Starting at the mouth of each jug, wrap with jute or twine to fully cover the mouth of the jug as well as the loose ends of fabric at the top. 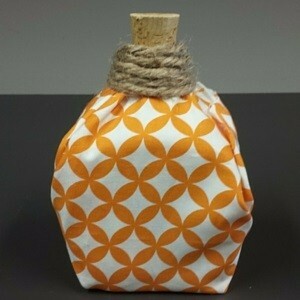 Tip: Secure jute or twine with hot glue as you go. Insert a large cork into the mouth of each jug to create a pumpkin stem. Have other milk jug craft ideas for fall? We’d love to hear how you get creative with your empty milk jugs. Leave a comment (pictures are great, too!) below with your most creative use of milk jugs for the fall season!